Someone just woke me up. Probably another festival artist arriving. These crazy airline flights all arrive in the middle of the night! I could hear the electronic lock spinning around and around until it arrived in the right position. Then they took a shower. I could hear the water running. As I tried to fall back to sleep, a number of things came to mind which I forgot to mention in my previous email. Today the festival opens. There’s a press conference at noon which I am expected to be a part of. The newspapers will ask me questions about American politics, I’ve been told, and I will talk about the unity between our countries through the arts, the importance of freedom of expression, and I’ll say that as an artist I’m not political. Paco Pena and his dance company will open the festival at the opera house tomorrow night (tonight), which I’m very excited about. I LOVE flamenco. Keti and Nina said he’s now the foremost flamenco guitarist in the world, and his dance company is the best. On Tuesday, I will perform Lilia! in the same theatre where I saw (the first two acts of) The Cherry Orchard last night. It’s a beautiful theatre with a couple of huge lobbies with art exhibits. Beautiful art work. I’m told this theatre, “M. Tumanishvili Film Actor’s Theatre” is the third most famous in Tbilisi. It’s really lovely with red velvet seats. It doesn’t have typical theatre style seats. But very wide upholstered chairs with wooden arms and legs. The style of the furniture here is unlike anything I’ve seen. Lots of curvy lines of wood, velvet and brocade. There are thick velvet curtains on all the windows I’ve seen – in my hotel room (no problem with light leaking in), at the restaurant downstairs where I ate lunch, in the lobby of the theatre. I commented about this to Nina and she said it’s the Russian Influence. Russian windows are always covered with thick velvet curtains – especially in the Hermitage. She also explained that the style of acting in The Cherry Orchard is considered pure Stanislavsky. She summarized it with: “I don’t believe you.” He was constantly questioning whether his actors were being truthful from the inside out, every moment. Oh, and this was interesting. Last night when Andro picked me up at the airport, he spoke English so well that I asked him whether he was an interpreter. He said, “No, I’m head of the newspaper here.” He was very young. He said he was one of the organizers of the festival and that he’d been to New York a couple of years ago with Keti when she got a Fulbright to do her one-woman show there. They had 3-month visas to stay in the United States, and when they returned to Georgia after two weeks, the officials asked them, “Why did you come back?” Apparently, it’s unheard of to get a 3-month visa and only stay for 2 weeks. People either stay for the full three months or else don’t come back at all. I asked him if he knew Ronald Rand from last year. He said, “No, I didn’t work at the Festival last year. I was in the Peace Corps. Training began the day after I returned from the United States.” I asked where the Peace Corps had sent him, and he said he worked in the Georgian countryside. I wish I’d asked him more specifics about that. Okay, back to sleep I go — into the drafts folder this goes. I’m going to send this before breakfast. The hotel is lovely and I slept a good solid 7 hours, before taking a luxurious shower. Great water pressure, hot water, clean, fresh. Let’s see – impressions. Where do I begin? Last night, I stepped off of the plane – the airport in Tbilisi doesn’t have gates. A bus took us from the runway to the airport building where we went through immigration. It was 4:20am. I bought some Georgian currency before getting online for the immigration. No one asked me any questions going through. My passport was stamped. Easy. I got my luggage, and exited the airport. “Taxi?” A man asked me. “Just a minute, I have to see…” I looked for a sign with possibly my name on it. There was a man holding a sign that said “GIFT.” I was overjoyed! His name was Andro, and he spoke excellent English. He welcomed me, took me to the car with his driver waiting. We loaded the trunk, and they drove me to my hotel. I asked Andro about the situation with the Russians. He said Georgia has no problem with the Russians. It’s the Russians that have a problem with the Georgians. He said all flights, trains and mail have stopped between Russia and Georgia. He said the Russians refuse to allow their artists to participate in this festival. The festival still has excellent relations with the Russian artists, who wish they could participate. He said all Georgians have been deported from Russia, and Russia has requested their nationals to return. There are many mixed marriages – Georgian-Russian, and the spouses have been separated and may not be reunited for 5 years. I’m not sure where that 5-year figure came from, but that’s what I heard him say. This morning, I came downstairs to the hotel dining room. There were no patrons, no menu. I walked in, a staff member pointed to the room full of empty tables, indicating I should sit down, then disappeared into the kitchen. After a while, I wondered if the kitchen was even open, because no one came out. I poked my head in, and several people working away motioned for me to go back and sit down. Quite a while later, they put a huge spread in front of me – fresh tomatoes, cucumber, a soup of rice, potato, carrot and dill, and some kind of sausage with french-fry-looking things. Everything was delicious. I have no idea what time it is here. My ears and eyes have been peeled since my flight arrived, waiting for some hint of the local time. There are no clocks ANYWHERE and no one announced it on the plane (at least in English). I’m typing this message from the computer at the front desk of the hotel. The man working at the front desk went over to the restaurant/bar across the lobby so I could use his computer. It’s wild using a keyboard with Cyrillic characters, where the keys are in different places. Anyway, there’s no internet access in my room. No wireless anywhere nearby. So much for Skype! I was invited to use this computer any time, but it means displacing the front desk person. I was told I could bring my laptop down and hook it up to their internet connection to send and receive messages. Tonight, I’m going to see The Cherry Orchard with Keti Dolidze, the Artistic Director of the festival. Her daughter-in-law is on her way here now to pick me up and drive me around for a tour of the city. The next message I’ll type from my computer and bring down to send. Just arrived home after ducking out of The Cherry Orchard before Act III. I was nodding off like crazy, incorporating the stage action into my dreams, unsure of what was dream and what was the play. My new friend Nina, who took me around Tbilisi today, along with Ylena (Keti’s daughter-in-law), sat beside me whispering translations into my ear. I couldn’t understand half of what she was saying with her accent. I was embarrassed to have my eyes closed when she turned to me, but my semi-conscious state didn’t stop her. At intermission, I told her not to worry about translating for me, because the relationships and action were interesting enough without. She said, “No, no problem, I don’t mind.” I could see it gave her great pleasure to do it, so she continued through Act II, as I continued to nod off. At the second intermission, she asked if I was tired. Yes! So she called for Keti’s driver to take me home, and here I am. The Georgians are very connected to their history and the legends of those who established their country. This afternoon, Ylena and Nina took me through some narrow little streets with stores and restaurants. We went into a souvenir shop. Everything there was handmade in Georgia. There were a number of little paintings of saints, which I asked Nina about. A haloed St. George was pictured riding a white horse with an upside down dragon at the horse’s feet, and a gold leaf sky backdrop. “Why is he riding a horse, and why is he famous?” I asked her. “Was he famous for slaying a dragon?” I asked. As Nina and Ylena led me through the streets, they explained how Georgia is a mix of Europe and Asia because it’s located plunk between the two. They pointed out the Persian and European architecture side by side. Fascinating! They drove me by the big fortress walls on the hill. They told me how Georgia had been a country already in the 6th Century BC, and how it was constantly under attack. For 2600 years, Tbilisi has been attacked and seized again and again. For thousands of years, the people of the city have run up the hill to hide behind the walls of the fortress whenever there was a new attack. Yet, despite multiple millennia of being overtaken by aggressive forces, Ylena and Nina were proud that Georgians had managed to maintain their own unique culture, heritage, language and alphabet. They said there are only 14 alphabets in the world, and Georgian is one of them. I discovered that Georgia is still mostly an agrarian society. When all those shortages were happening in the Soviet Union during Communism and people lined up out the door for a loaf of bread, that wasn’t the case in Georgia. Families had their own farm animals and vegetable gardens. Ylena and Nina are together in the same Masters degree program in Journalism at the University. I asked if the Georgians had ever attacked anybody throughout the centuries. “We didn’t have time! We were too busy defending ourselves,” they said. And that’s why Georgia still has a recovering economy. Up until a hundred years ago, they said, Georgian girls were forced into marriage at age 12. If the husband found out the girl wasn’t a virgin, he would have her publicly shamed, sometimes even killed, similar to Muslim practices. Now that’s changing, they said, though chastity is highly prized in the Georgian culture – even today. They said Georgian men love Russian women because chastity is a non-issue for them. On the other hand, Georgian men believe Georgian women are much more intelligent and interesting than Russian women. I asked Nina if she’d ever been to the U.S. No, she said. A natural curiosity for one coming from such an ancient culture! Isn’t that beautiful? I told her I love it. In 2006, Lilia! was performed at GIFT – Georgian International Festival of Arts in Tbilisi. That story was never told until now that we’re returning to perform Felicitas. It was the khachapuri that inspired me. In 2014, we were performing Felicitas at the Players Theatre in Greenwich Village when Steve discovered Old Tbilisi Garden around the corner on Bleecker Street. Knowing I’d been to Tbilisi, he suggested we eat there. It quickly became our post theatre hangout. When the show closed, we went back whenever we were in the neighborhood. Then, we made special trips and brought all of our out-of-town guests there. The New York Times soon reviewed it and declared: “If there is one Georgian dish that could bring Manhattan to its knees, it is adjaruli khachapuri...” Steve’s favorite! One day, as we boxed our khachapuri remains to savor for the next day, it occurred to me: “Why don’t we return to Tbilisi to perform Felicitas at the GIFT Festival?” I’d done Lilia! there in 2006. Steve would be able to experience magnificent Georgian food first hand. I wrote to Keti Dolidze, the festival director and the rest is history. We leave this week for a performance of Felicitas on October 25. I’d always intended to write about that 2006 Georgian trip. Today, I went back and reread emails I’d sent from Georgia. I will share them in segments to follow. This story was originally posted on my Facebook page, May 20, 2016. Word on the street is that Hamilton tickets are difficult to acquire. In mid-March, the box office said 4-14 tickets are released every day and sold at face value. The 10 or so people that day began lining up at 6am. A scientific method for obtaining tickets. Arrive early enough and you’re in! Then Lin-Manuel Miranda won the Pulitzer. Then the show broke records with 16 Tony nominations, of which 4 were for him. Michelle Obama called Hamilton: “the best piece of art in any form I have ever seen in my life.” Ben Brantley’s New York Times review suggests it “might just be worth” mortgaging your house and leasing your children to acquire tickets. People began camping out in tents on the street to acquire those 4-14 released seats. Professional line standers appeared. Rules cracked down. No tents, no chairs, no leaving the line, no substitute line holders. Wednesday, May 18 was my Hamilton day. I wrote it into the family calendar weeks ago. Lin-Manuel Miranda was scheduled to perform. Warm enough to wait on the street for 14 hours with comfy, cushioned seat and snack foods packed along with a dense book (The Hare with Amber Eyes), I set off at 5am. I arrived to find a line at 5:50am. The first 4 people had been waiting since 2:30pm on Tuesday. The next 4 had arrived at 11pm Tuesday night. Surveying the line, it was a toss up whether I should stay. I would have tickets 15&16, if that many were released on a 2-show day. Uh-oh. What would I do if I was offered 2 seats for $477? Would I kiss $1,000 goodbye to see a play I could listen to at home for free any time? Not to mention the investment of a day of my life. Am I a lemming? Then, my husband Steve joined me for the lottery which took place at 12:30pm for $10 front row seats. We didn’t win. At 1:55pm, the first 6 people got matinee released tickets. A couple of them were standing room (after being up all night) for $40 a pop. We were now tickets 9&10 for the 8pm. Two of the people in front of us were professional line standers. With the new box office crackdown to eliminate professionals, the box office ended up releasing tickets after 7:55pm. At that point, it was too late for these guys to notify their clients. So at the last minute, they paired up to see the show together, which moved us to positions 7&8. At 7:57pm, the first two people in line were ushered inside for tickets, then the second two. We were now positions 3&4. Then the box office asked for only the next person. One ticket left? Former professional line stander #1 went in. A minute later his partner in crime disappeared inside. Steve and I discussed. We were next, if there was a next. What if only one ticket was available? We can’t turn it down. No way! Who goes? He said I should go since I’d been waiting 6 hours longer. “Next in line. Only one of you.” Steve pointed to me. It’s 8:01pm. I go inside and approach the window. “Two,” I hear myself say. “$354 please.” I fumble for my credit card, give it to him, he hands me a receipt to sign, I sign. He gives me the tickets. I go outside. Steve is waiting #1 in line for the next single ticket. It’s 8:02. I hold up the tickets and motion for him to join me. The Russian grandmother thinks I’m holding a ticket for her, too, while Steve hesitates, not understanding. I motion again. Confused, he follows me. “You got TWO?” Yes. We rush in, hand the tickets to the usher at the entrance. “Sharp right.” We make a bee-line right. I expect to see stairs to the nose bleed seats. After all, these are $177 tickets. The door leads us to the orchestra. We must be in partial view seats off to the side, I think, as I hand the tickets to the next usher. She points to the Center Section, Row G. I drop my stuff, the 2 professional line standers are next to us. They’ve never seen the show. I climb over them to get to the bathroom. The bathroom attendant tells me the show is starting. I return just as the lights are coming down. I’m in my seat as the first actor walks onstage. I’m breathless. I don’t know if I’ll faint or cry. I can’t believe these seats! Row G is raised above F so that not a single head blocks the periphery of the stage. At this point I’m very curious about how she got so rich. She asks our names. We tell her. “I’m Rosie. This is my daughter and it’s her 3rd time seeing the show. What do you do?” We tell her. Violin is her favorite instrument. She bonds with Steve over the amazing violin in Hamilton. She tells me she produced a one-woman show downtown at the Lynn Redgrave Theatre. Had I heard of the show? It rang a bell. I’m very much doubting this lady got rich producing a one-woman show. She tells me she’s thinking of doing her own one-woman show. Her background is comedy, stand-up. She won a talent search award on TV when she was 20. She hosted a TV talk show for six years on VH1. “Is that how you got rich?” I ask. Yes, she says. She’s made a few movies, too. Comedy. Next week she’s opening for Cyndi Lauper. She tells us about “Hamiltome,” the book in which Lin-Manuel Miranda explains it all. “It’s like open source,” she says. “He does this brilliant work and explains how he did it so you can do it too. Incredible.” The show is starting again. We drop to our seats. The two pro line standers come back. They flip when they see Rosie as the lights come down. She promises they can have their photo taken with her after the show. They’ve already gotten shots of themselves with Steven Spielberg. Act II is perfection to the millionth power. The show ends. Steve rescues a Hamilton memorabilia cup somebody left under their seat with half a drink. Rosie taps our shoulders and says, “Nice meeting you.” We head out into the night dizzy with wonder. “Did you include the story about how Mother and I got out of Austria?”my dad’s cousin Julius asked yesterday over brunch at his house in Half Moon Bay. Did I include that story? It’s the culmination of the play Felicitas I’m performing on Tuesday at Freight & Salvage Coffeehouse about the life of his mother Felicitas Sofer, an infant nurse from Vienna. He will see the play for the first time Tuesday – the play in which I portray his mother, based on stories he told me, accompanied by Steve May’s mandolin music. Felicitas Sofer was my great aunt “Lizi”. Her nursing territory included my Northern New Jersey hometown. In fact, she was the nurse who attended my home birth. My mother describes how when she was in labor, Aunt Lizi instructed her to walk up and down the hallway of our home, periodically dropping with her hands around Aunt Lizi’s neck to hang with full weight dangling for a minute, then back onto her feet to walk some more. I was expected the same day as one of Aunt Lizi’s other baby clients, but conveniently waited an extra day to accommodate the other baby. After writing two shows about Lizi’s older sisters – my grandmother actress Lilia Skala and great aunt, dancer Elizabeth Polk – it seemed hard to conceive of how a baby nurse might prove to be a worthy subject for the stage. Lizi’s work and life were very private. She never talked about her baby cases. I saw her only at Thanksgiving, Easter and Christmas. I couldn’t remember the sound of her voice or accent. What was there to write about? In 2007, I interviewed her son Julius hoping he might shed some light on her life. There were a couple of clues indicating she had a story to tell. One was that although she called herself Mrs. Sofer, she had never been married. Interestingly, the brief interactions I’d had with her on holidays were almost always about marriage. “There’s no reason why you can’t marry a prince. Grace Kelly was an American girl like you and she married Prince Rainier. It’s just as easy to fall in love with a rich man as it is to fall in love with a poor man,” she said. When I was five, I remember mentioning that my feet were sweaty. “Your husband won’t like that in bed,” she warned. It was only in junior high that my mother mentioned Aunt Lizi had never been married. “If I’d known about the skeletons in your father’s family closet, I would have thought twice about marrying him,” said my mother. Aunt Lizi once bought a wedding dress on sale at Filene’s Basement for her 16-year old niece Grace, even though Grace had no thought of marriage and hasn’t married to this day. Was Lizi so focused on marriage because she regretted not marrying? When I asked Julius about his mother’s life, a fascinating woman of selfless nobility emerged. He filled me in with juicy details about what motivated her decisions, who his father was, how he left Austria with her in 1939. I recorded and transcribed everything. And yes. These stories in addition to those from Lizi’s baby nurse clients will be revealed in Felicitas Tuesday night. 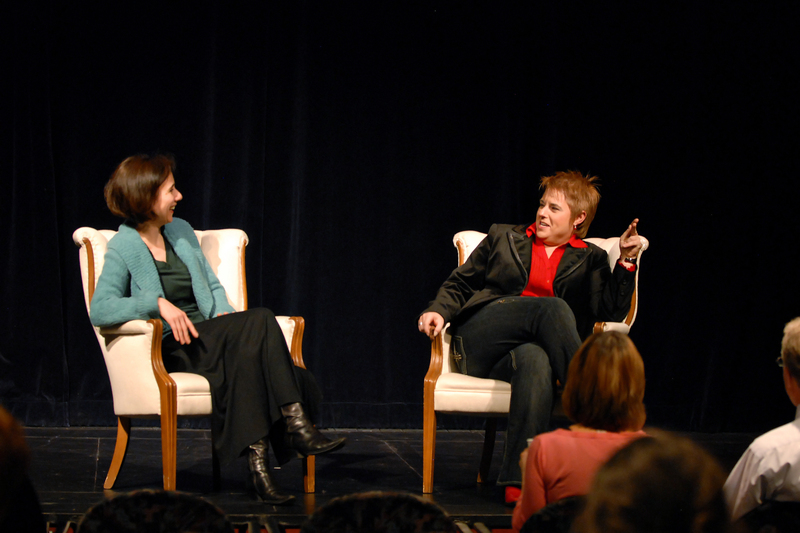 Q&A with Libby Skala and Val Lieske after a performance of Lilia! at Fire Exit Theatre in Calgary. Photo by Tara Whittaker Photography. After years of hearing about the value of career coaching, I decided to take the leap and sign up for six months of coaching with iCadenza, a performing artist consultant group. Before beginning, I was asked to answer a number of questions to help define my values and mission so that the next steps would become clear. Here are some of the questions and answers. My love of that special connection, communication, stillness, spontaneity, joy, wonder, discovery, listening, aha! that occurs both in individual and collective consciousness during a live performance. That intangible back and forth between performer and audience where mundane cares of everyday life are forgotten and people are lifted up, transported, and breath as one. The joy and wonder of taking people on a journey, holding their hand and guiding them along to view new vistas. When all of the outside and inside nagging voices are silent, deep down it’s because I know I CAN do it. When the work is coming from that deep place without the woulda-shoulda-couldas, without trying to please or impress- without the drowning voices of inadequacies, when all is one, then I sense or know a greatness that is so freeing, rare and precious there simply is nothing else. When I feel that, it is felt by others and reflected back. The result is beauty, clarity. Were there any clues early in your life that you’d end up doing this type of work? I began piano classes when I was 5. I loved helping children in class understand what we were learning. It made me feel smart and helpful. In first grade, I delighted in playing piano for my elementary school classmates. I loved their awe and excitement when they recognized a piece. In second grade, when I began writing reports, I remember how engaging it was for me to write what I’d learned, intrigued by my own interpretation of the subject as it poured onto the page, conscious of my reader’s amusement as I wrote. At that moment, I felt like an adult and knew I could be a journalist reporting on subjects of my fancy to a wider audience as a supplemental job. I wanted to primarily be an artist because I loved making artwork and saw how much pleasure my artwork brought to the adults in my life. One day when I was home alone, the distinctive voice of a family friend came out of me. I began talking in her voice and entertaining myself. I never shared that ability with anyone until I began developing my first one-woman show at the insistence of my teacher Gary Austin. What’s holding you back the most in your work? Forgetting who I am and why I’m here. There are many highlights. The most recent was developing, marketing and performing a new show with my musician-husband in 8 weeks, about a subject most said wasn’t stage worthy. We had a packed house, the audience loved it, many said they liked it better than my first two shows. My sister called the next day in tears saying she was so proud her daughters have me as an aunt. What’s a major obstacle you’ve had to overcome? Feeling unprepared to perform a brand new show for the first time when there were reviewers in the audience who ended up panning it. With wise guidance from friends, I was able to build in more rehearsal time to perfect the show, invite each reviewer back, get back on stage and make it work. What are the top three highlights of your life? 1. Marrying my husband. That may actually be my proudest accomplishment, as well. 2. Having an elderly man in Hutchinson, Kansas come up to me after a performance of Lilia! with tears in his eyes and say he had never been so moved and that to make a man cry was really something. 3. Dallas Travers’ “Actors Breakthrough” workshop. I’m going to add a fourth: seeing tears running down my mother’s face during an early incarnation of Lilia!, then telling me it was because she’d never thought of me as beautiful before. This makes me think of a fifth highlight: An elderly gentleman telling me after a performance of Lilia! in London that it was one of the most beautiful evenings he’d ever had in the theatre. He then identified himself as a former lead dancer in Diaghilev’s Ballets and toured with them for years. I’d just visited a Diaghilev exhibit at the Victoria & Albert Museum and what he said meant a lot to me. What’s one random thing you know a lot about? The stories of my forebears. Where can you be found when you’re not working? What’s your favorite way to spend a weekend or a Sunday afternoon? At a museum. I love the way a curator puts together an exhibition, framing the subject and communicating it with a unique spin to the public. Plus, I love learning about the subject matter and getting an in-depth understanding of it. What do you love to talk about more than anything? The stories that have brought us to where we are today, that have shaped and formed our lives, that have guided and changed us. Why does it matter that your artistic project exists in the world? My artistic project connects us to one another. It connects us to our own histories – where we came from, where our parents came from, who they are, how their stories affect who we are. My story is your story because I’m giving it to you, now it’s yours to compare and contrast with your own, to add to your repertoire and experience. You have lived vicariously through it, too, as I have lived through the story of those parents and grandparents whose stories I share. What do you know about your artistic project that you wish other people knew and understood? It’s portraiture in the same way that Cezanne painted his wife and child again and again applying his artistry to a subject he knew and loved intimately. Only this portraiture is in 3-D with light, sound and moving gesture, but is (at its best) as much a framed portrait as the Cezanne on the wall of the Metropolitan museum, only crafted with different tools. What makes your artistic project unique? How do you want presenters and venues to feel about working with you and presenting your project? I want them to feel joyful, justified, remunerated and rewarded artistically and financially. I want them to feel like the show exceeded their expectations by not only fulfilling their mission as presenters, but by meeting the artistic and cultural hunger and intellectual curiosity of their audiences beyond measure. What’s the philosophy behind your project? That we are all one and yet embody infinite individuality and uniqueness, forever evolving, growing, becoming more and more self-aware and aware of the world around us. Sharing our stories and living through the telling of others’ stories illustrates this. What’s your message to your fans/audience? My message is: We’re all alive right now here in this moment of infinity together and share a common humanity. I’m teaching by demonstration – even as I’m learning it for myself in the moment it’s happening – how to live, what life is, what love is, what substance is, what resonates most deeply. Let’s embark on that journey together for the next hour or more. Why do audiences need to hear what you have to offer? To be reminded of who we really are. We get so distracted by the fears and obstacles we encounter as we work our way through life, that it’s helpful to see the lives of others laid out before us on stage objectively. To be able to watch and live vicariously through these stage characters and their experiences, realizing that even in their imperfections, by hook or by crook they triumphed over obstacles. Audiences need that joyful, entertaining, moving, inspiring nudge reminding them that they can do it, too, and fulfill a life of purpose. Their insightful truthfulness, honesty, authenticity, their affectionate depiction of mankind. Comforted, inspired, reassured, encouraged, moved… to feel understanding, to feel enlightened, engaged, committed… to feel recognition, to feel curious, thoroughly entertained, full of wonder, amused, uplifted, focused, recharged, refreshed, renewed, delighted.. to feel joy and bliss. Give something of value to the world from my heart that is a unique and authentic expression of who I am. I see my work as a means to learn, to grow in my understanding of life and the world around me, as a way to connect with others. I see it as a means to expand my perception of possibility in myself and others. Sensitive, artistic, creative, perceptive, intuitive, imaginative, hungering for hope. – Have a big vision, love people, love ideas, are effective and creative at executing their ideas. – Are intelligent, courageous and perceive the infinite potential in people, places and things. – Are tenacious, persistent, patient, energetic, curious. When I think of resiliency, I think of bouncing back, of something that can’t be held down. It’s driven by a desire to live and a belief that life is worth living, even in hardship. My grandmother Lilia Skala was very frank with me about the darkest hours of her life – when she felt doomed in Nazi-occupied Austria, when she was hopeless in America about ever having an acting career again, when facing divorce. But she also said the blessing of tribulation is that it’s like a furnace separating the dross from the gold. It either makes you or breaks you. It never leaves you where it found you. When she arrived in America, she promised herself to never look back. She acknowledged past events, but disciplined herself to live in the present and to avoid ruminating. She chose to be grateful for good instead of viewing a glass half-empty. As a result, after 25 years, her career blossomed with Oscar, Emmy and two Golden Globe award nominations well-beyond standard retirement age. I love being reminded that resiliency is a choice. It is a healing concept. My deep desire is that sharing the remembrance of my grandmother, alongside Susan Polis Schutz’s film and Susan Cernyak-Spatz’s book – will collectively bring a ripple of insight, inspiration and joy to Colorado audiences. Libby Skala performs Lilia!, a one-woman show about her relationship with her grandmother actress Lilia Skala, alongside Susan Polis Schutz’s film Seeds of Resiliency and Felice Locker’s play “Jostled,” directed by John Moore starring Wendy Ishii, followed by speaker Susan Cernyak-Spatz, author of Protective Custody, Prisoner 34042 at Bas Bleu Theatre in Fort Collins, CO. www.basbleu.org.